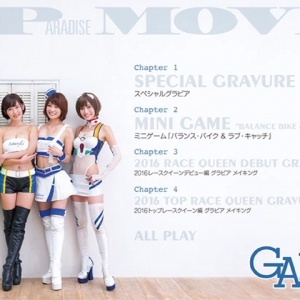 The end of year Gals Paradise Movie is a return to the mix of race outfits and bikinis reminiscent of the idol movies of old. The 2016 movie is packed with 15 of the years most loved race queens. Campaign models from the 2017 Auto Show, comes with a free gift of a 2017 calendar. The end of the year DVD special. The featured race queens are Kiyose Machi, Hiro Miyuki, Saito Ayumi, Minori Fujii and Oshino. The DVD is 120 minutes and region free. The annual Top 50 Race Queens edition is out covering race queens from different walks of motorsport. This isue also inludes a free gift of a lens cloth to wipe those marks away. The Gals Paradise 2016 race queen debut edition includes a free gift of a double sided poster. This edition has the top ten from the newcomers’ category from the 2016 Race Queen awards. Date of the latest issue is September 17, 2015. 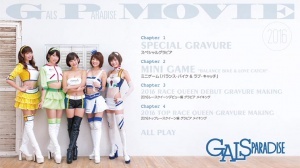 This issue of Gals Paradise continues its tried and trusted approach to documenting all the new Race Queen rookies.